As part of the launch offer, Samsung is bundling the Galaxy A70 with U Flex neckband headphones for an additional Rs 999. Samsung's U Flex Bluetooth earphone usually retails for Rs 3,799 in India. 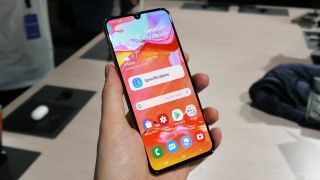 With a Full HD+ (2400 x 1080 pixels) resolution, the Super AMOLED screen on the Galaxy A70 measures 6.7-inch in size. There's a u-shaped waterdrop notch on the front which houses a 32MP selfie camera having an f/2.0 aperture. The display is also embedded with an optical fingerprint reader.